The thieves were well prepared. They brought a ladder, tools and, allegedly, a belly full of beer. In the dead of the night they scaled the walls of The Gym in Motueka, New Zealand, and gazed upon their target. It was purple. It was seven metres tall. It was a giant inflatable gorilla. In an audacious act of primate-napping the health club, near Nelson, fell victim to some serious monkey business. Owner of The Gym, Jessica Nelipovich, said the deed came just two days after the $10,000 piece had been installed. "I think beer was involved," she said. "I don't think it was anything personal toward me or my partner or the gym as such. It's hard to know what motivates someone but there would have been a degree of planning and tools to dismantle it." She said it was about 3.30am on Sunday when what looked like two people were caught on CCTV footage going to "great lengths to vandalise" the business. The footage showed the thieves use a ladder to scale the building's roof to get to the towering primate. Six different anchors and a number of securing rings could not hold the beast. They were unbolted in preparation for the audacious act. However, then the footage shows the pair visibly struggling with the gorilla. They obviously failed to take into account its weight, Nelipovich said. By now the balloon was deflated and so were the thieves. They abandoned their scheme. 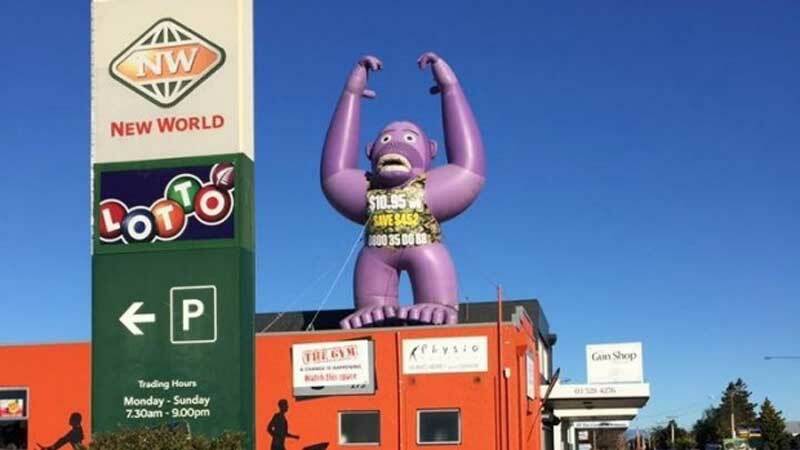 They threw the gorilla from the building's roof and sent it hurtling into the car park below. "This wasn't the reckless act of some teenagers out after hours," Nelipovich said. "It required a substantial amount of effort." After finding the gorilla's lifeless form in the morning Nelipovich filed a police report. Nelipovich said she and her partner Shane Blows, who had only recently taken over The Gym, were disappointed by the act and are working to have the gorilla re-installed after it had been checked for damage. "It surprised me that something like this would happen in a place like Motueka." 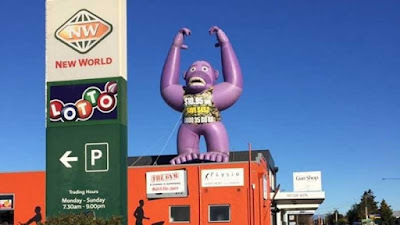 The gorilla was hired from Creative Fitness Marketing which is based in Australia. 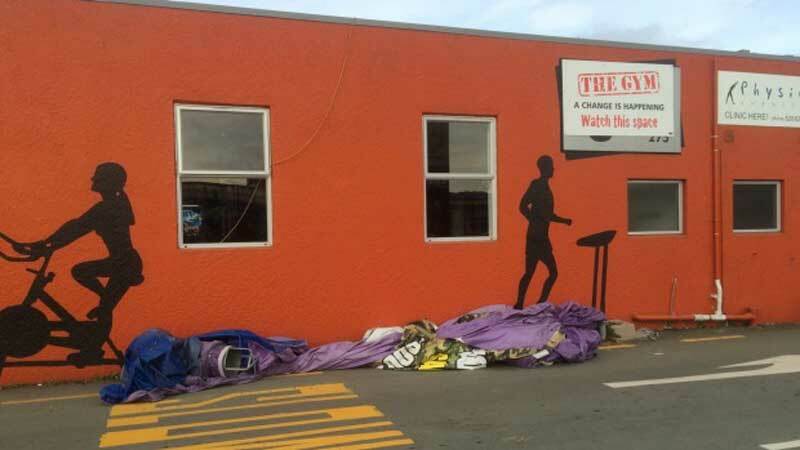 Nelipovich said the device needed to be professionally installed and a handyman would be flying down from Auckland on Tuesday to check the balloon for damage and to re-install it. She said they would now look at installing an "auto-deflator" to bring down the gorilla overnight. Extra bolts would be put in place to deter future attempts. Police are investigating the incident and will look at street CCTV footage in hopes of obtaining a description of the would be thieves. Sergeant Rob Crawford said police were following "strong lines of enquiry" but were not in the position to share footage at this stage. Anyone with information has been urged to contact Nelson Police.